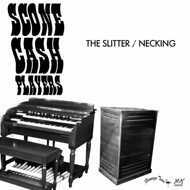 “The Slitter” by Scone Cash Players cuts a deep groove from the raw funk just as a steel slitting machine cuts metal strips from raw steel coils. The music mimics the sharpest of the upper and lower cutting knifes used to split into the hard cold metal. The Hammond Organ has much in common with a steel slitting machine. It is large, difficult to operate and potentially dangerous. It is an archaic piece of equipment that requires a seasoned master to be able to operate it with favorable results. Hammond organist Adam Scone is this kind of master. The music was made as a tribute to the steel workers in his family and from his musical hometown of Youngstown, Ohio. He is accompanied here by the master producer and guitar player Thomas Brenneck of Dunham Records and one of the greatest and most in demand funk drummers on the NYC scene, Eric Kalb. Together they slice a devastatingly stone cold groove.